Also known as the famous Rice Krispies treats! Kellogg’s® Rice Krispies, a puffed rice cereal, has been enjoyed for breakfast since 1928. That’s right, 90 years of starting the day! About 10 years later, Kellogg’s® test kitchen developed, what has now become one of the most popular treats in history— Rice Krispies treats! This became our inspiration for a frozen yogurt soft serve version expected to become a favourite for everyone. 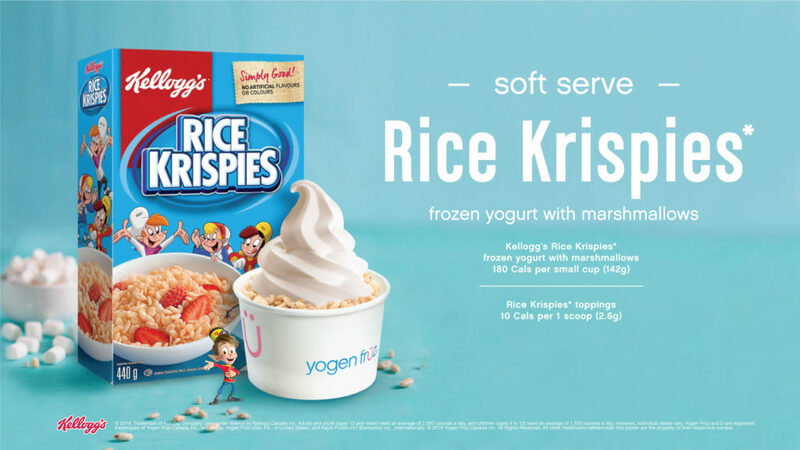 It’s a perfect blend of Rice Krispies cereal, sweet marshmallows and creamy yogurt. This beloved treat is consistently popular with kids and guaranteed to bring back delicious childhood memories for adults. Prepare to be amazed by our soft serve re-creation of this timeless, irresistible snack. Find Kellogg’s® Rice Krispies with marshmallow soft serve frozen yogurt at locations in Canada, USA and Puerto Rico with Ü Serve or We Serve options. Click here for Canadian nutritional information. Click here for USA nutritional information.